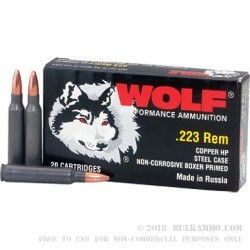 A 55 grain copper clad projectile with a fantastic load behind it, offers great versatility out of the .223 Remington Steel cased Wolf Ammunition. This grain weight is plenty versatile for the .223 Remington and the speed and energy delivered with the round makes it suitable from the most mundane target and plinking work, to the most precision varmint hunting up to and including deer or other moderate game hunting and even for impromptu personal defense uses. Out of a 1 in 8 inch; 1 in 9 inch or 1 in 10 inch barrel, this round is excellent and it will still perform, albeit with accuracy changes in other twist rates for the caliber. The expectation of this round is that it is a sub 150 yard load, that when needed, can go out to twice that distance easily. Within the 150 yards it’s got peak accuracy of about 1.5 MOA and generally will shoot out of most firearms at sub 2 MOA. The boxer primer offers some respite to those who might consider reloading the ammunition but given the price point and the difficulty to reload steel cartridge casings, it is better off left at the range in favor of purchasing more WOLF from BulkAmmo.